I have prepared this to entertain my guest during weekend. As it is my own creation, there is nothing much for me to write about this recipe. The dish is simple to prepare and requires only household mini ovens for the grilling. 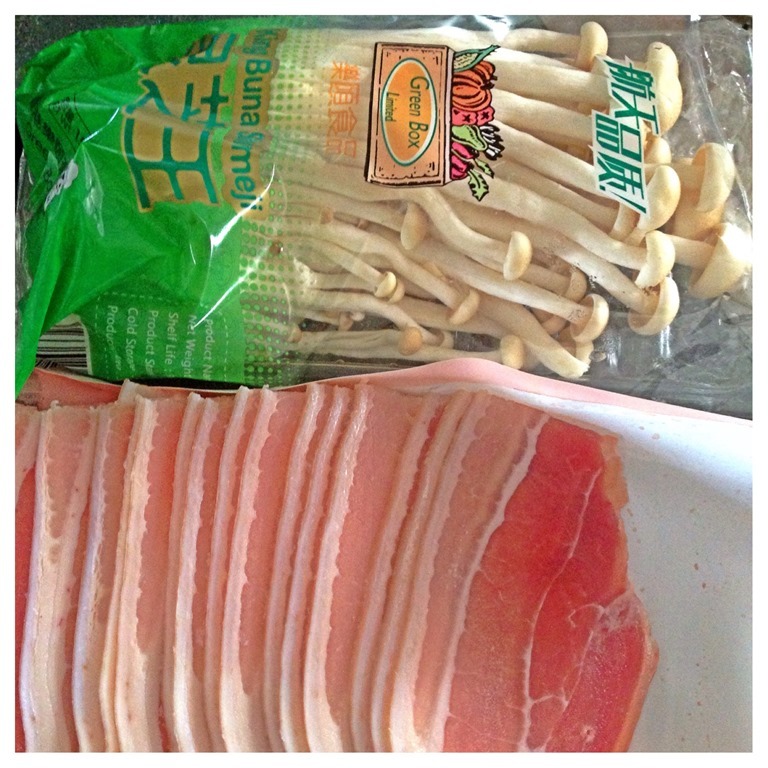 There are only two main ingredients, Shimeji mushrooms and sliced pork belly meat. Variations are many and if you prefer, you can always use beef rolls or change to other types of vegetables such as asparagus. 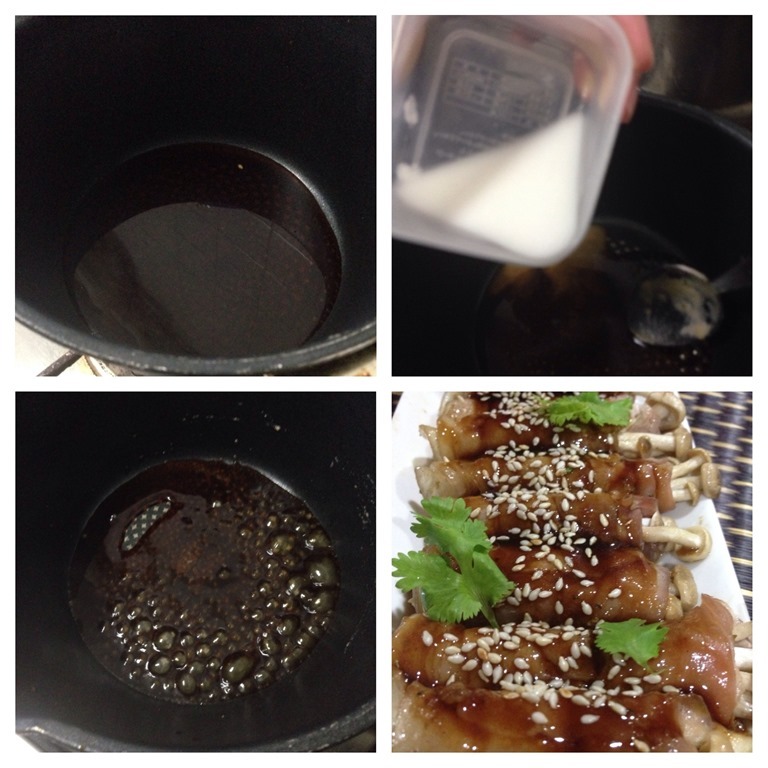 I have prepared two types of sauces for the meat rolls, the Italian Oregano Cream Sauce and the Korean Barbecue Sauce. 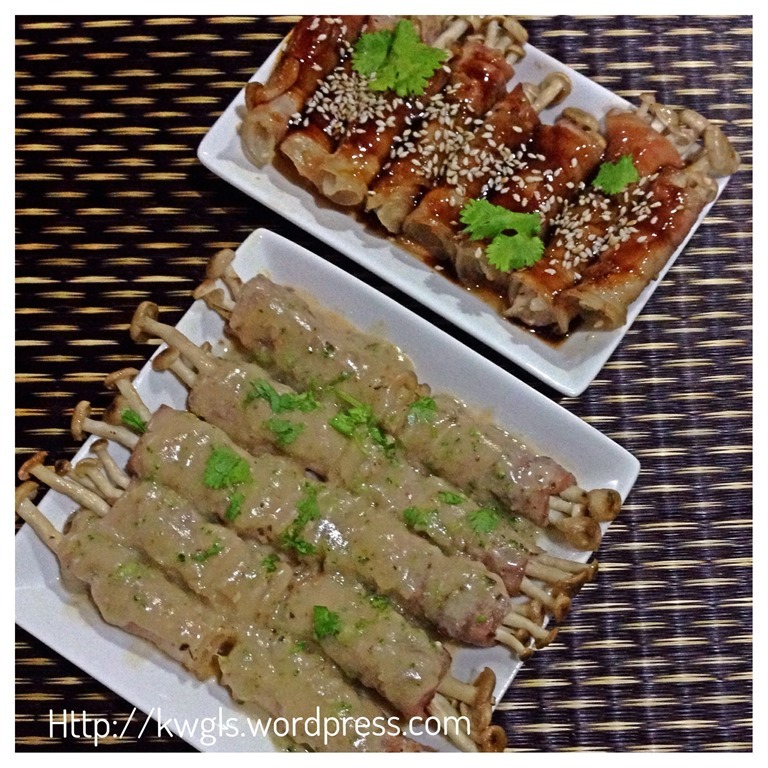 The Oregano Cream Sauce Meat Rolls are savoury whereas the Korean barbecue Sauce Meat Rolls are slightly sweet. 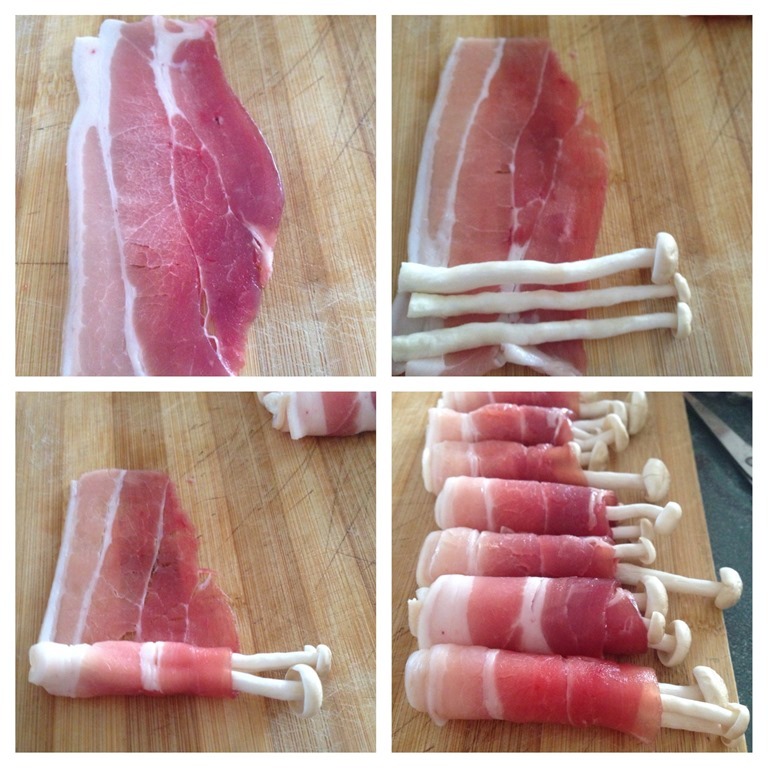 Wrap the mushrooms using the sliced pork belly meat as above. For Italian Oregano flavoured meat rolls, brush the meat rolls with butter, sprinkle with salt and some oregano herbs. Marinate for at least half an hour. 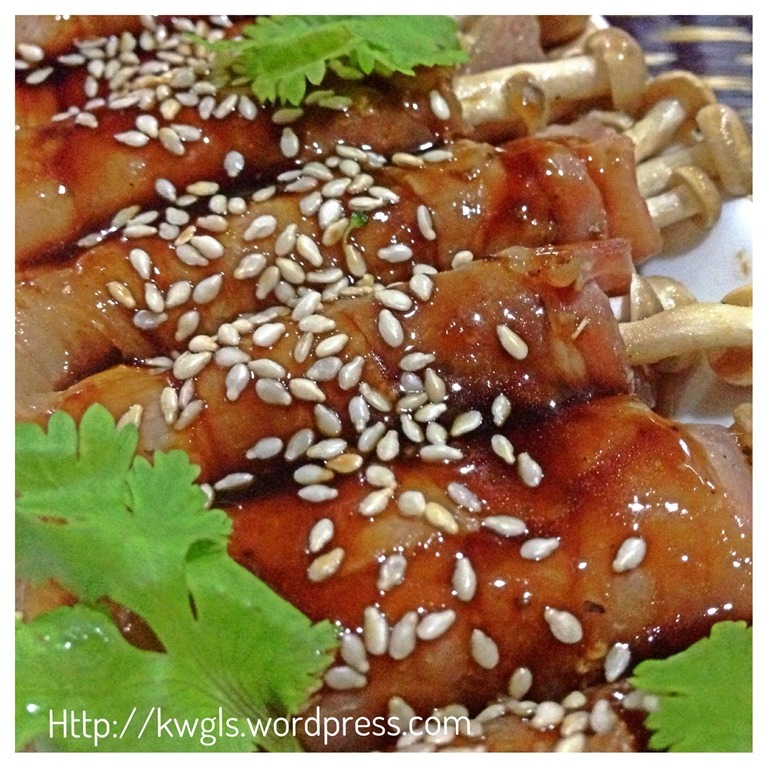 For Korean Barbecue meat rolls, use 2 tablespoons of Korean Barbecue sauce to marinate the mushrooms meat rolls for at least half an hour. Grill in the mini oven or toaster for 10 minutes. Open the mini oven, change to the other side and grill for another 10 minutes. If you are using a conventional oven, preheat the oven to 150 degree Celsius and baked for 5-10 minutes for each side. You will witness some meat juice in the baking tray as the meat rolls are grilled. Keep these meat juices for making of sauces. 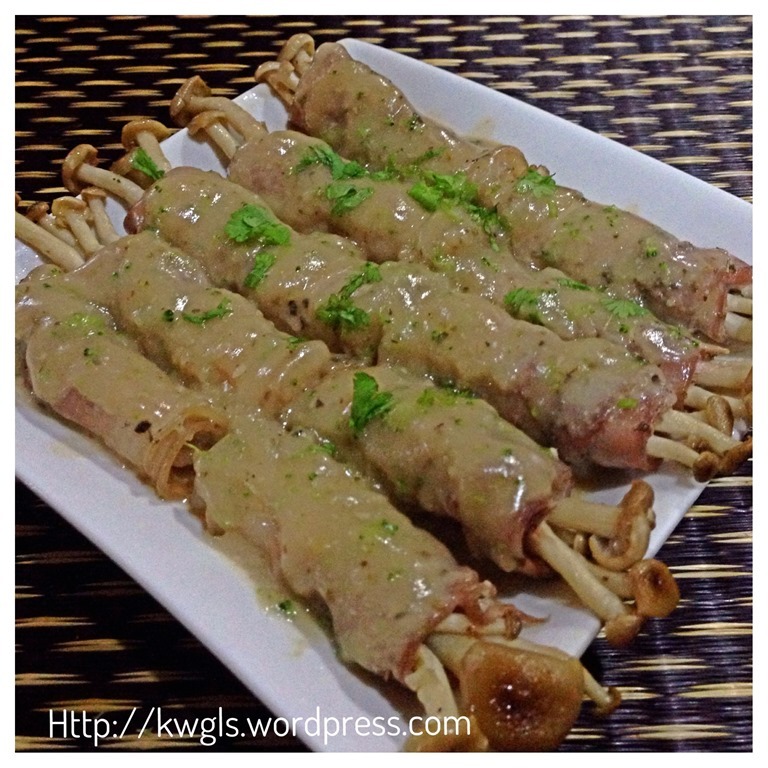 Italian Oregano Mushrooms Meat Rolls – In a small sauce pan, put in the meat juices from grilling of meat rolls. If there are no meat juices, just put 5 tablespoons of plain water. Add some oregano dried herbs (half a teaspoon), 1 tablespoon of cream and 1 tablespoon of plain flour. Stir until well mix and bring to boil. When the sauces boil, off the heat and drizzle on top of the meat rolls. If the sauce is too thick, just add a few tablespoons of water to dilute it. Garnish with some chopped parsley if desired. 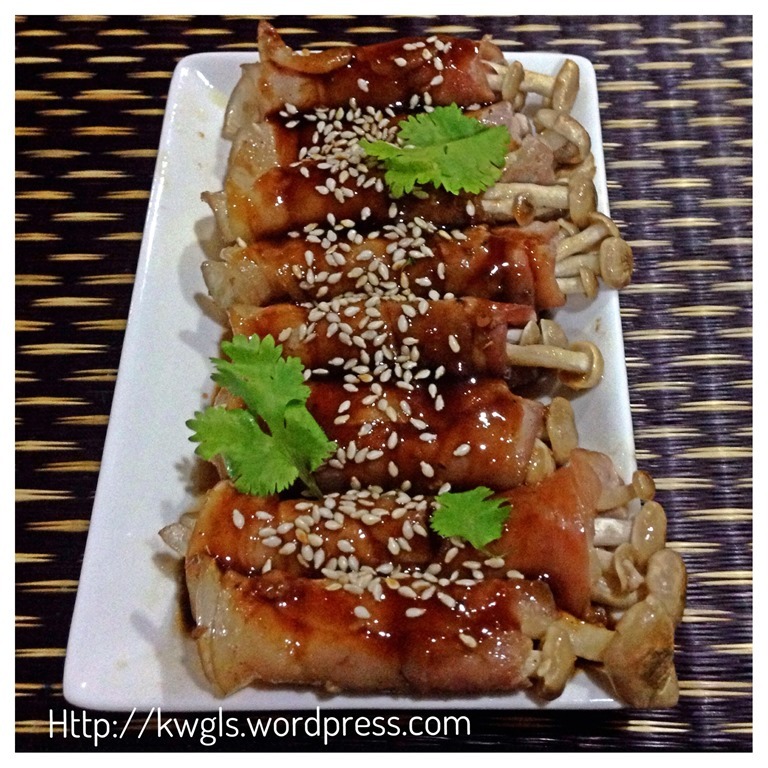 Korean Barbecue Mushrooms Meat Rolls – In a small sauce pan, put in the meat juices from grilling of meat rolls. If there are no meat juices, just put 5 tablespoons of plain water. Add 1 tablespoon of Korean Barbecue Sauce to the meat juice or plain water. Bring to boil. Meanwhile, add 1 teaspoon of corn flour with 5 teaspoons of water to make a starch solution. Gradually pour the starch to the boiling sauce Once the sauce boil again, off the heat and drizzle on top of the meat rolls. 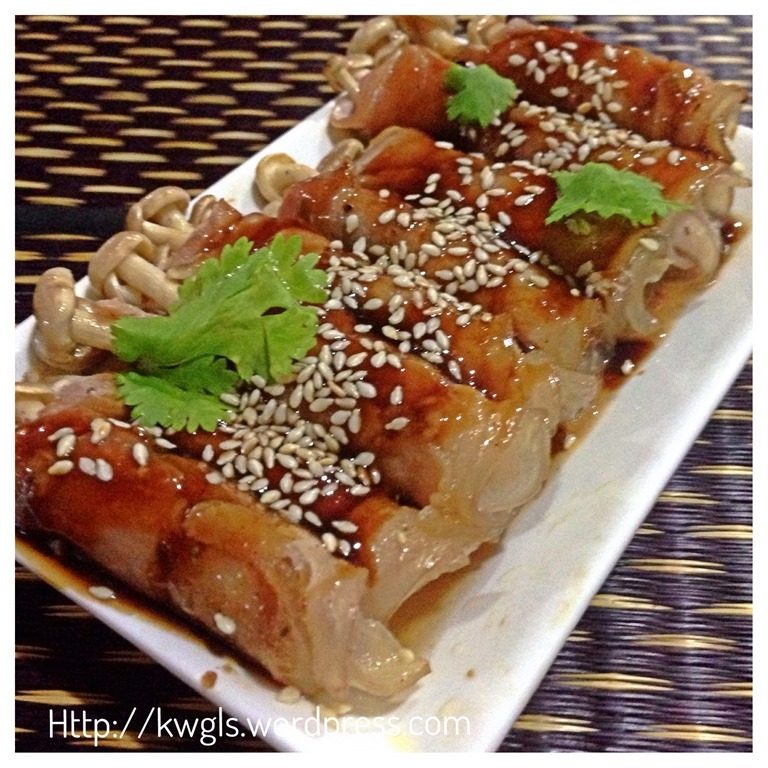 Sprinkle some sesame seeds on top and garnish with coriander leaves if desired. Isn’t this a simple recipe? 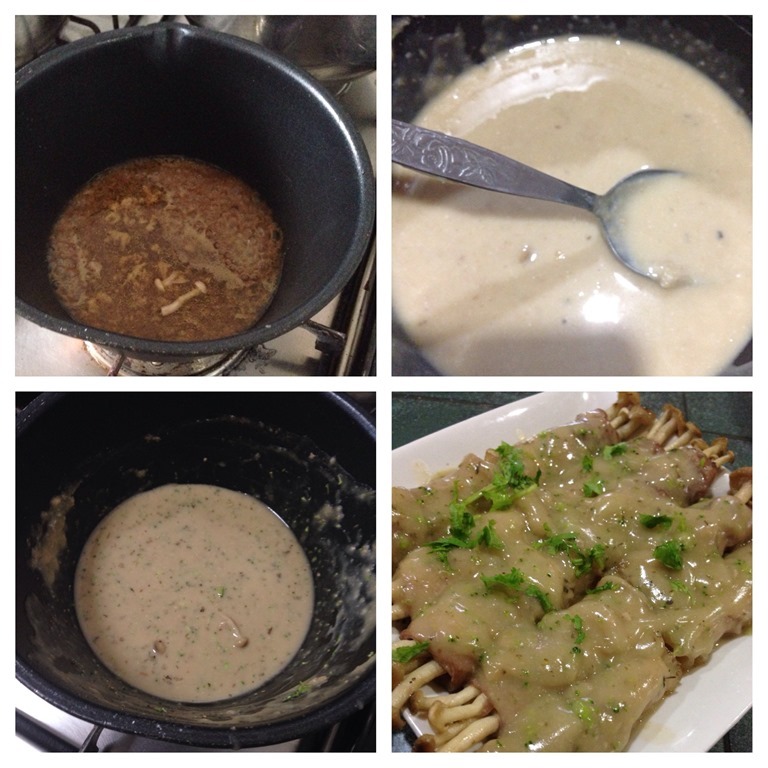 However, it is a presentable dish and my guests loved it. Do try to make this and remember, you can always substitute the meat rolls with beef slices and mushrooms with other types of your desired vegetables such as asparagus. Hope you like the post today. Cheers and have a nice day. 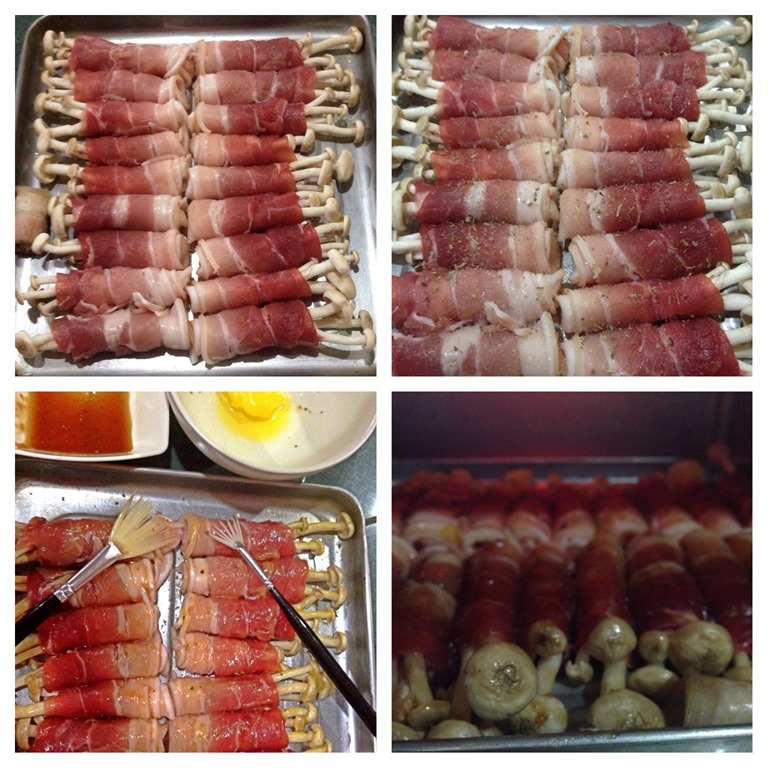 This entry was posted in Dish, Food Preparation Series and tagged 8, Bibigo Sauce, Grilled meat rolls, grilled mushroom meat rolls, Guaishushu, Italian cream sauce, korean barbecue sauce, Korean BBQ sauce, postaday. Bookmark the permalink. These look wonderful! I will be pinning this here in a few! Thanks for sharing! These sounds great and the presentation, as always, is stunning. Pinned!